I had the privilege of being asked by Gary McHale to speak at the June 10th town hall meeting in Caledonia about my recent experience with the OPP, and how I came to be involved in this fight for our freedom, but due to time constraints I omitted a great deal of what I had to say. With this forum, I can go into much more detail so perhaps it was a blessing that we ran short on time. How I came to be part of the Caledonia Wakeup Call family is something most can probably relate to. I heard that some guy from Richmond Hill was going to hold a March in Caledonia on October 15th 2006, and I was intrigued. I found his website and I read that he intended to march onto DCE and I knew I had to be there. I attended the March for Freedom because I was angry. I had been reading and hearing stories all spring and summer about impossible things happening in this quiet Ontario town, and I lost hydro for 2 days because of an attack on a Hydro station by these criminals who had invaded DCE. It seemed like every day there was a new story about something obscene happening in Caledonia and yet there was never any report about the OPP stopping them. The media predicted nobody would show up, and the politicians clearly wanted nobody to show up, so I had to be there! I stood as just another face in a crowd of 1500+ and listened as Toby Barrett spoke. I listened as Mary Lou Lapratte from Ipperwash and Ann Marie Vansickle of Caledonia spoke about the horror their lives had become at the hands of the Native Terrorists and the OPP who refuse to touch them, and I was infuriated. At that moment I knew I had to do something about this. I was very ready for the march onto DCE. Then Gary McHale took to the podium, and spoke about how the only way we could make a real difference was through peaceful, lawful protest. If we behave as the criminals do, we accomplish nothing. It’s a tough message to get into an angry mind, but something about the way Gary said it just made sense to me. 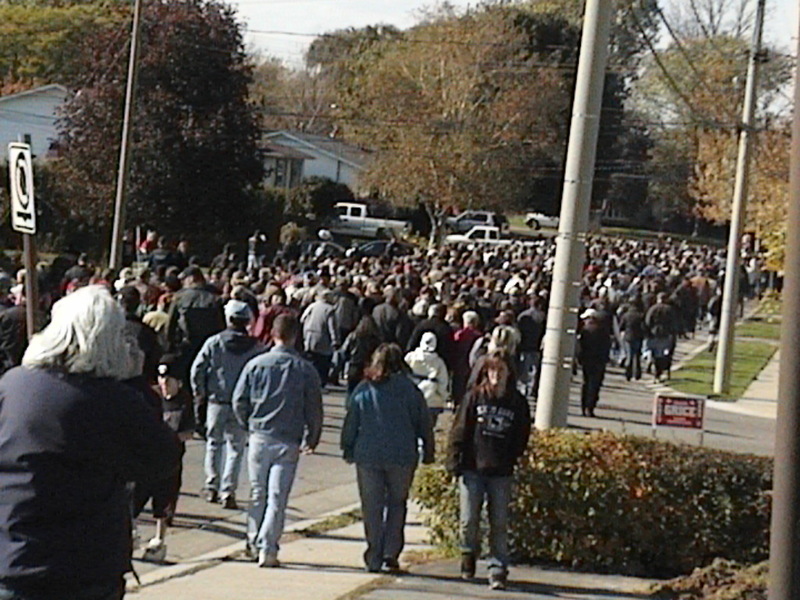 We marched through Caledonia, and naturally the OPP were out by the hundreds to keep us far down the street from DCE. After Gary left, I decided to explore a bit as I had never been anywhere past Argyle Street in Caledonia. From the Notre Dame School yard I could see the large wooden barrier that had been built by the Natives to keep people out and I wanted to get a better look at this. 3 OPP officers ran over to stop me at the exit from Notre Dame. I was told I would be arrested if I stepped one foot closer. They stared at me like mannequins when I asked what the crime would be, but they were clearly intent on keeping the public off of a public street so I left and went to see what all the commotion was about on Argyle Street. The scene was nothing like what was portrayed in the media that day. A “no go zone” of 100 feet had been established by the Government, but the OPP were lined up in massive numbers to keep the public hundreds of meters away from DCE. The atmosphere was unlike anything I had ever experienced as the OPP kept their backs turned to what we knew were violent criminals on DCE, and focused on keeping the hundreds of us who dared to want to see what was happening away. They stood shoulder to shoulder doing their best to block even the view of what was happening down the road, and you could clearly see a Riot squad not far from this line prepared to attack if we did manage to get past the front line officers. Meanwhile Natives were gathered at the entrance to the property they had stolen waving and taunting us and in the background even from so far away you could clearly head the beat of Native drums. With Gary’s words still ringing in my head, I decided to leave. I had learned a lot that day about the serious problems in Caledonia, and every major news network was there taping so surely the entire Country was about to learn all of this too right? I watched every major news outlet that night and the papers the next day, and not a single one of them spoke about what really happened at the March for Freedom. The focus was the people who challenged the OPP after the event was over, and the numbers were reported to be anywhere from 200 to 500 in attendance at the actual event. It was completely slanted to look like a small group of people came to town to cause trouble and absolutely none of the important facts we learned that day were broadcast. It was like the entire Country wanted to ignore what was happening and hope it simply went away. I knew I had seen history in the making and I had to become a part of this group. To do so would require me to fully embrace the concept of peaceful protest and not allow myself to be controlled by the anger in me. That’s not the easiest thing for a young Irish hothead to do, but I figured out how. Consider for a moment how much energy it takes to be angry. Not just irritated or frustrated but totally enraged. If you run around for an entire day full of rage, you’re going to be completely drained by the time it’s over. The trick is to harness that energy and focus it on doing something to make a difference instead of using it to scream and rant and try to start fights. Using that same energy that had fueled my rage, I set to work on finding a way to become part of Caledonia Wakeup Call. I spent countless hours scouring Gary’s site, Voice of Canada, and the few articles I could find online that could teach me more about what we were up against. I soaked in every article, news report, video, and editorial about this struggle and started to eat, sleep and breathe learning everything I possibly could. I also emailed Gary a ridiculous number of times trying to get his attention, but talk is cheap and I knew I had to take action to really get the message across of how dedicated to this fight I was becoming. 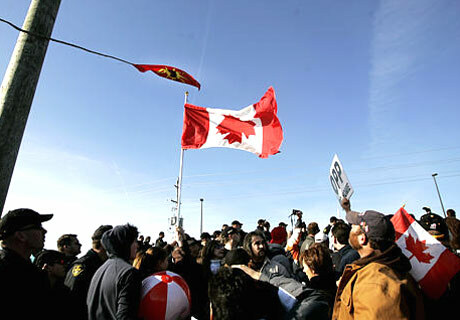 When the announcement of a second March for Freedom to protest the illegal arrest of a Caledonia citizen who tried to place a Canadian flag on a hydro poll on a public road came, I showed up with 25 Canadian flags. On December 16th I took my first real action and I made a ripple on the radar screen. Those 25 flags didn’t last long as most people had shown up without one, but when I had handed out all but 2, I saw an opportunity. The OPP had their typical human barricade set up to keep us from exercising our constitutional right to hang a flag, there was plenty of media present and they were interviewing Gary McHale who was of course within feet of the ridiculous police line. I told a few citizens what I was about to do knowing they were likely to make some noise about it, and I marched toward that OPP line with my last 2 flags in hand. They did a beautiful job of getting the attention of the media to “watch this guy. OVER HERE OVER HERE” as I walked up to the OPP and stuck Canadian flags in their faces. Someone in the media later tried to say I attempted to force my flags on the OPP, but all I really did was walk up to them, extend my flags to them, and ask them ” would you like a Canadian flag? ” They are Canadians after all. Of course they each either said no, or refused to speak to me but the media was watching and that moment later made it onto almost every major newscast. I turned around to find a flurry of microphones and cameras in my face which honestly I had not expected (and to this day I apologize to Gary as I did interrupt his interview) and questions were hurled at me by at least 10 different reporters. CTV, CBC, CFRB, CHTV, A-Channel News, the Hamilton Spectator, the Brantford Expositor, the Sachem, the Simcoe Reformer, the London Free Press, they all wanted to know why did I do that, what do I hope to accomplish, why am I here, what was the significance of what I just did, who am I, where am I from, what am I going to do next, etc. I honestly didn’t expect this and what I did was spur of the moment, so my answers were not all grade A quality and much of it did not make the news that night, but the image of what I did, and at least one statement I made was broadcast on most of those channels. I did not see Gary’s reaction, and I have never heard anything about that specific incident from him, but I have no doubt he noticed it and if I had to guess I would wager there was a smirk on his face. Shortly after that, I witnessed a man I’d had little knowledge of until then give an excellent speech to the crowd. His name is Mark Vandermaas and he runs VoiceofCanada.ca He got a massive ovation from the crowd for calling out the media and the OPP on their absolute failures to uphold the law, and to report the real facts about Caledonia. I knew right away this was someone I had to talk to later. Not long after his speech, we got around the OPP barrier by simply walking across the street and through a field toward the sacred hydro poll the OPP so desperately wanted to keep us away from. It was incredibly amusing to watch the OPP running down the street trying to find a spot to set up to stop us and in the end they had to climb into a ditch around the poll to form a new line. Although neither Gary nor Mark attempted to cross this line or to hang their flags on the poll, they were both illegally arrested and taken away to Cayuga to be illegally detained against their will by the OPP. The rest of us stuck around and held our ground against the OPP for the better part of an hour after that, but they refused to allow us our right to freedom of expression and continued to stand in the ditch guarding that hydro poll from us. The same poll I might add that had a Mohawk Warrior flag hanging from it. Most of the media left assuming that nothing more would happen with Gary and Mark gone, but CFRB stuck around and came to interview me again in light of what had just happened. I had a solid 10 minute conversation with the reporter and I don’t know if my comments were ever aired, but it proved to me yet again that I was making progress. Naturally later that day the media reported that Gary had trespassed onto the publicly owned DCE to try to hang his flag which was as far from the truth as you can get, but some good stories about the absurdity of those arrests were printed the next day. I had some excellent conversations with residents of Caledonia that day, and one more thing happened that really made me understand I had accomplished something and was very inspiring. I stopped at Tim Hortons to get a coffee on my way back to the car and while I was waiting in line, an elderly woman who required the assistance of a walker got out of her seat, came up to me and said in the most sincere tone ” Thank you for coming here today “. Some very attractive young ladies also thanked me for what I had done or gave me a big thumbs up on my way out, but it was that simple extremely heartfelt thank you from the lady with the walker that made an impression on me which I will never forget. I focused my efforts in the days that followed on contacting Mark Vandermass which at the time was a very difficult thing to do. There was no contact information for him listed anywhere. He and I had some excellent conversations and he quickly grew to be someone I am very proud to call a friend. I owe him a great deal as he gave me my first opportunity to work with the group. Shortly after this I attended a public meeting in Caledonia and met Gary McHale face to face for the first time. On January 20 2007 we returned to Caledonia and had the most extraordinary day. The media once again failed miserably to cover any of the real events of the day, but it has been covered extensively by both Gary and Mark so I won’t rehash all of the details. I will gladly share my personal highlights though! The OPP made an extreme effort leading up to that day to brag to the public that they were completely ready for us, that there was no chance we would get around them again as we had on December 16, and that anyone who tried to do so would be arrested and criminally charged. We made them look like the complete fools they are many times over that day. The first and perhaps best was by finding a way around them which put us all very legally within 15′ of the DCE criminals in a way that they had no control over. For roughly an hour we stood face to face with these thugs who spewed the most racist and vile comments at us they could muster (and believe me it was filthy) and we simply looked at them and peacefully waved Canadian flags. They literally burned themselves out screaming at us and walked away. We confronted Julian Fantino at the Unity Rd OPP detachment in Caledonia where he cowered inside and peeked out a window at us, shortly after this I had the honor of going on a “flag run” with Gary McHale where he actually did manage to hang his Canadian flag near that hydro poll they so desperately wanted to protect from us, and I came very close to getting to hang mine as well but a bus full of OPP officers showed up to put a stop to that. I discovered that his flag had been stolen some 20 minutes later and accompanied him as he forced the OPP to admit that they had illegally removed his flag “to prevent a breach of the peace” which the officer was unable to explain, Mark and I confronted a large group of Natives from DCE who were harassing a woman and a young child with more of that X rated language, and at the end of the day I was privileged enough to have dinner with some of the core members of the team. Since that time, I have attended every event and meeting that Caledonia Wakeup Call has held and I have used the energy that used to be rage each and every time to dive into anything I could do to help. I have gotten to know Gary McHale who I am very proud to call a friend and I’ve become part of the most dedicated and fearless group of human beings I have ever met. I’m sure that sounds like a lot of work to the average person who wants to get involved but isn’t sure how to do it. If that’s what you’re thinking right now, you are absolutely correct! I have basically put my life on hold and made this fight for our freedom my mission in life. This way of doing things is certainly not for everyone, and involves a great deal of personal sacrifice and investment in time, energy, money and potentially our own personal safety as we are not fighting a group of friendly teddy bears here. Hard work, constant education about everything that’s happening not only in Caledonia but across Canada as we stand at the crossroads, constant ridicule from those who refuse to understand or accept what is really happening to our Country, and being shunned by even friends and family who choose to continue to believe the propaganda that this is some kind of battle against Natives are facts of every day life for me now, but I wouldn’t give it up for anything in the world. As Gary has always said, the key to changing the system and ending this nightmare is simple peaceful protest. No Violence, no racial slurs, and no swearing. Having spent time personally with him, I can tell you that these are not just words. What you see in public is what you get in private with Gary McHale. I have never once heard him say anything remotely racist, never heard him swear, and he is the least violent human being I have ever met. In my next article coming very soon, I will explain how each and every one of you can easily get involved, and make a real difference in this fight without having to take the risks that we have. Big things have been accomplished by small , determined groups. Sometimes it doesn’t come fast enough to save some people from the fallout(Ipperwash) but persistance I believe will pay off. Innocent victims of the native agenda will not except the status quo as the numbers of victims increases. Our Country was built on Law and Order. We just need the right leaders in place with the Political will to settle this problem in a Fair, Just, and Equitable manner for all. 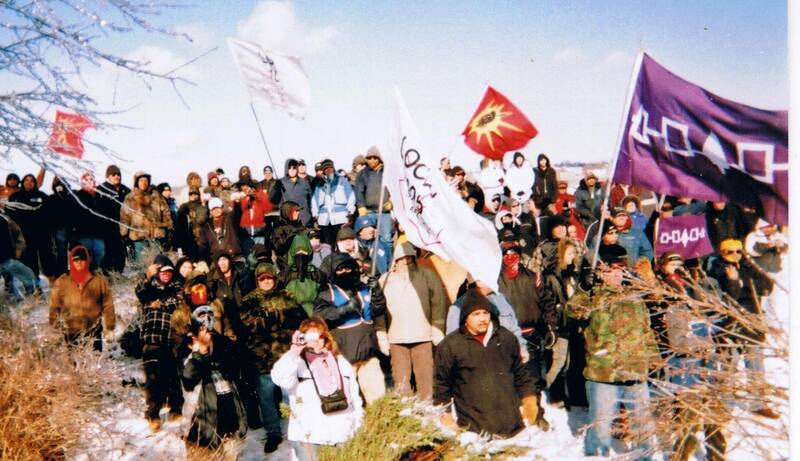 I am proud of you, CaledoniaWakeUpCall and Voice of Canada. I’m rarely at a loss for words, but find myself nearly speechless right now Mary-Lou. For those who don’t know, Mary-Lou LaPratte was the first person to stand up and fight a violent Native occupation by the means we use today. She pioneered the fight against 2 tiered justice as a resident at Ipperwash more than a decade ago. I wish that this group had existed back then to help you Mary-Lou, but everything in this corrupt system was designed at the time to make sure that most of us had no idea what was really happening to you. I believe Caledonia was doomed to a similar fate until the right group of ‘outsiders’ decided they had seen enough and would be silent no more. Thank you very much for your kind words, and I promise you I will not stop until the status quo is once again Law and Order instead of Appeasement and Cowardice. Setting aside the silly insults for a minute, it seems Dr. Rivers is deliberately trying to miss the point altogether, I’m afraid. I didn’t see anything in your post that said Canada shouldn’t deal fairly with legitimate land claims. The fact is, however, is that the feds have consistently said the DCE claim is invalid, just as one of the 3 claims in Ipperwash was (the one against the residents’ homes). Since he seems so eager to ignore the reality that innocent people – both native and non-native – are being victimized by the refusal of the police to enforce the law, I wonder if Dr. Rivers would be willing to change places with Sam Gualtieri (beaten almost to death by native punks in a house he was building for his daughter)? Perhaps the good doctor would like his daughter or granddaughter to move in on the 6th line and have to take medication and go to counselling because of the trauma Dancer’s suffered because the OPP refuse to police her road. How would he feel about her being raped on the Douglas Creek Estates by lawless punks who have driven out the original occupiers with their violence? http://voiceofcanada.wordpress.com/victimizing-native-people/ and listen to the speech I gave on October 8th about how native people were being victimized by Two Tier Justice. You might also want to have a look at the videos in the post below that show a close up look at the ugliness of landclaim lawlessness. It isn’t pretty. If you want to stand with these thugs, be my guest, but I sure wouldn’t be too proud of it. Dr. Maitland Rivers, needs a history course in Canadian history. As a Canadian of scottish and mohawk descent, you clearly known little of the country you speak of. 500 years of colonial rule did not produce the problems of today, CREED and MONEY did. Until the details of land deals are made completely PUBLIC, no one knows for sure what happened in these deals. My grandmother recalls a number of stories of chiefs taking off with the money land deals with the crown. There is some history to prove out such tales. CREED AND MONEY still are the motivating factors today. Todays woes depending upon where you live have one consistent problem bad chiefs who do not take care of the reserve or territory properly with the money given. No different from the politicians today. Where I live the chief does not want to include off territory mohawks because it will take away from those on the territory. So you see even in aboriginals there are classes of people. Most of these is a class war within the groups. In this case Caledonia’s residents are the hostages, and have been for far too long. You no doubt would not like to live next to a reserve or have your city taken hostage either. So go back into the hole you call a home and read. Read BOTH sides of the argument. Read about BOTH sides of victims. Until you do, you will never understand anything,. Until I see first nations people not spewing hate (like Shawn Brant), embracing all those who do not live on the territories as kin not traitors, hunting because they have too, not to prove a point by spear fishing spawning fish and then dumping it on the city” doorstep, actually taking care of the land, not clear cuting it for money, then I will consider listening. That day is not here, and I fear with even MORE CREED AND MONEY today it may not come. It has always been about CREED and MONEY and will always be.